A pretty, manicured lawn can be quickly destroyed by an armadillo. 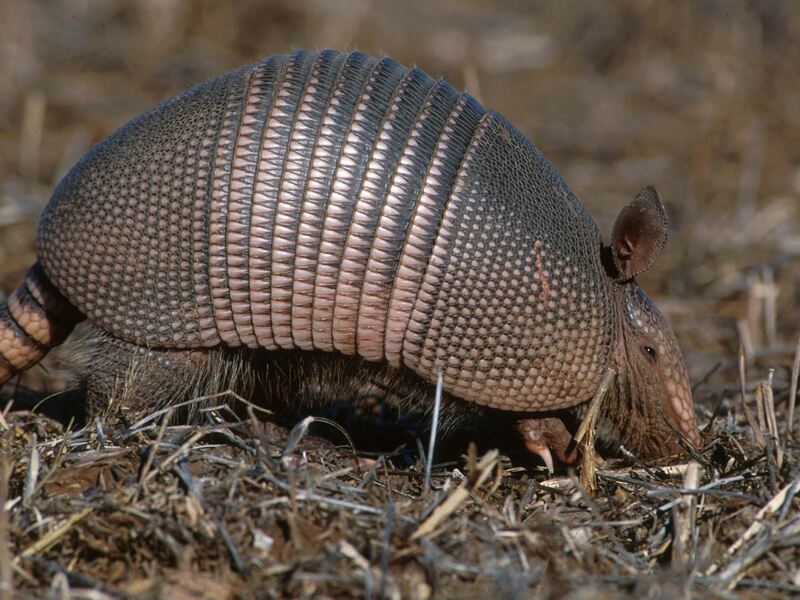 The word "armadillo" means "little armored man", and was given to this peculiar animal by Mexican Indians. Pink to tan colored with nine armored bony plates. Approximately 18 to 24 inches long with tail. Extremely sharp front claws. Mostly a nocturnal animal, but sometimes seen in the daytime, especially during the cold fall and winter months. 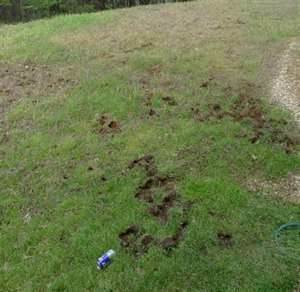 Dogs small holes in lawns and flowerbeds while "grubbing", (hunting for grubs). Mainly active March and April and August thru September, but can be active year round if conditions are right. Makes large den holes by digging with the front claws. A known vector of Leprosy, extreme care should be taken when dealing with this animal, live or dead. Produces 4 identical quadruplets when giving birth. If surprised this animal will jump vertically 2-3 feet straight up.Can hold its breath and walk along the bottom of small streams to evade capture. Like the Great White Shark and the crocodile, vitually unchanged from prehistoric times, except for its size.The local armadillo is the "Nine Banded Armadillo" due to the 9 overlapping armored bony plates on its back. 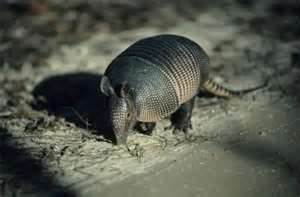 Ace offers trapping, capture and removal services for current armadillo activity and also offers preventative lawn grub treatments to stop armadillo activity from starting in the first place. March thru Apri and August thru September are the optimum times for grubicide applications. 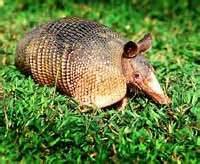 ARMADILLOS ARE VECTORS (CARRIERS) OF LEPROSY. BE EXTREMELY CAREFUL HANDLING LIVE OR DEAD ARMADILLOS OR ANYTHING WITH THEIR BODY FLUIDS ON IT. 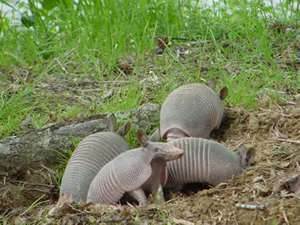 ACE PROVIDES TRAPPING AND REMOVAL OF ARMADILLOS IN BENTON, BLANCHARD, BOSSIER CITY, DOYLINE, ELM GROVE, GREENWOOD, HAUGHTON, KIETHVILLE, MINDEN, MOORINGSPPORT, SHREVEPORT AND STONEWALL. small holes in your lawn popping up overnight? big den holes around your slab? mulch beds being destroyed overnight? seen armadillos in your yard?